Pinnekjøtt. Salty. Rich. Chewy & tender. ‘Tis the season when the year’s hard work of rearing, raising, rounding up, & preserving culminates into a grand finale. For 1.7 million Norwegians, that means pinnekjøtt. And thanks to the lovely ladies at Rollag Stasjon, I got to indulge a little bit earlier this year. They prepare pinnekjøtt from the famous spælsau from Numedal (read more about Numedal). 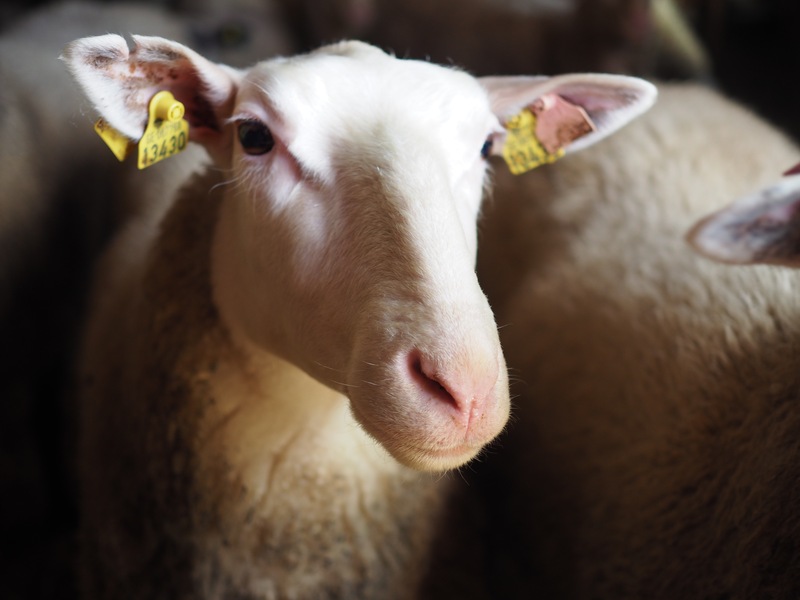 Spælsau has grazed more on scrubland, willow and herbs than other sheep breeds, which gives the meat a more wild feel. The meat has less fat and is well marbled. 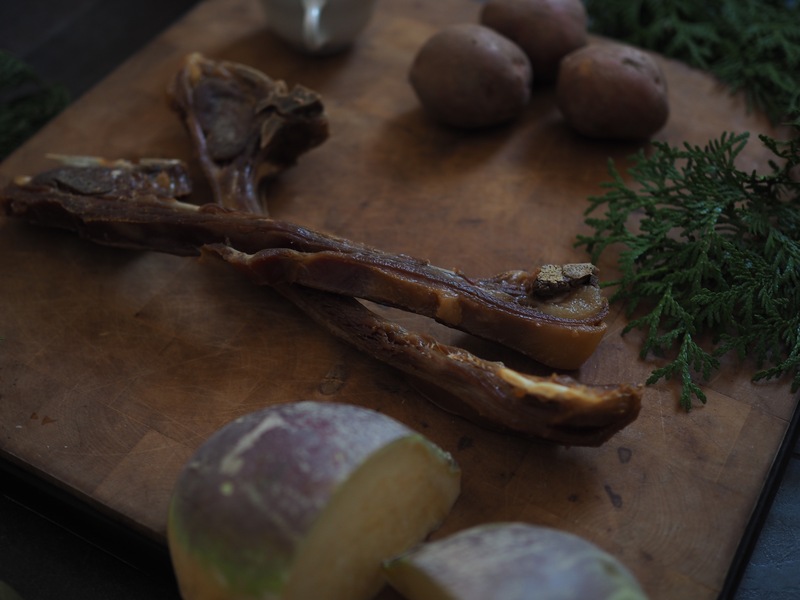 Raised & processed in Numedal, it is some of the best lamb you can get in Norway. Don’t be fooled. These little tempters may look minimal, but boy, do they pack a punch of flavor that will have you coming back, year after year. 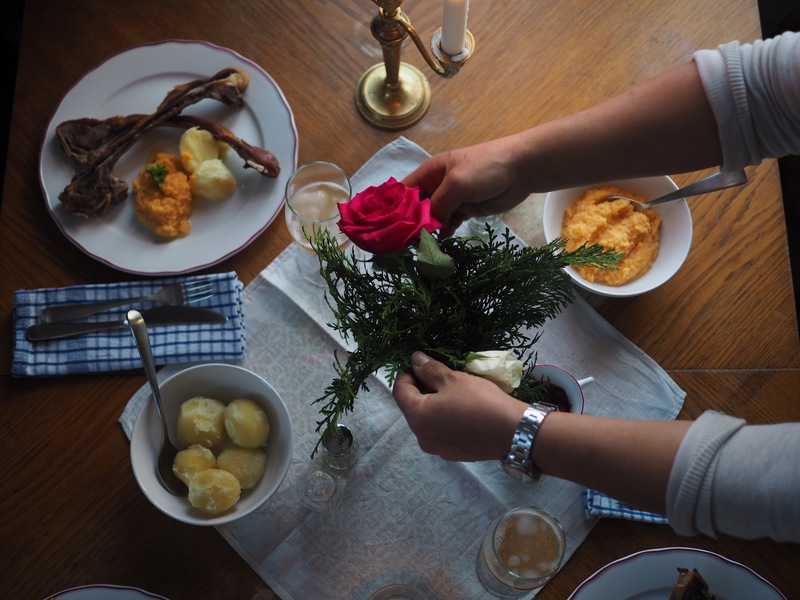 A tradition emerging from a time of preservation and festivities, pinnekjøtt remains a dish primarily served on Christmas Eve. 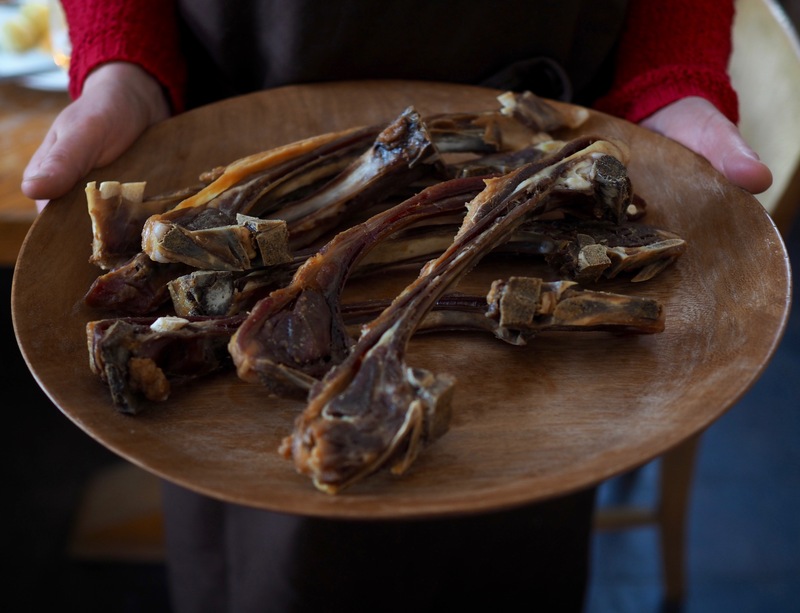 Pinnekjøtt is made from lamb/mutton which undergoes a process of curing. The rack of ribs are soaked in a salt solution & then hung to dry for 6-8 weeks when finally, the racks are cut, and steamed over birch branches, or sometimes smoked or even more rare, boiled. Drying the meat, gives it a unique flavor and an aroma. That aroma always brings me back to my first introduction, some 10 years ago. 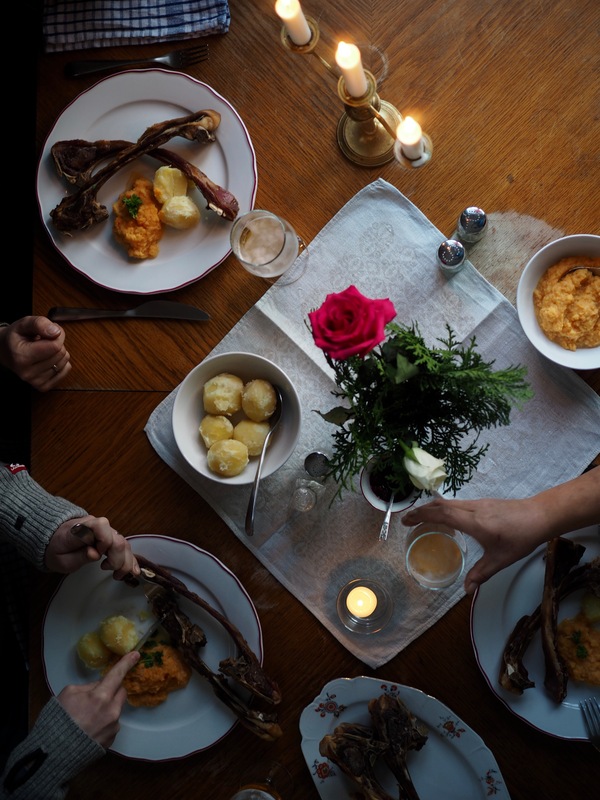 I watched my father-in-law with such curiosity as he took down the ribs hanging in their storage room and proceeded with such fervor to turn the dried rack of meat into the most delightful of dishes. I remember being in awe. Because there was something deeper than just the meal. Even more than the tradition of eating it every Christmas Eve. There was a history to it. An appreciation unspoken. A time when people, mainly from Western Norway, did not have a lot, and so they saved & preserved. And when they came together, they indulged in this resurrected meat that could only be as flavorful and rich because it was given the time to become so. Nowadays, you can easily buy packaged pinnekjøtt from the store but there’s immense value in going through the entire process yourself. It’s about taking the journey with the animal. 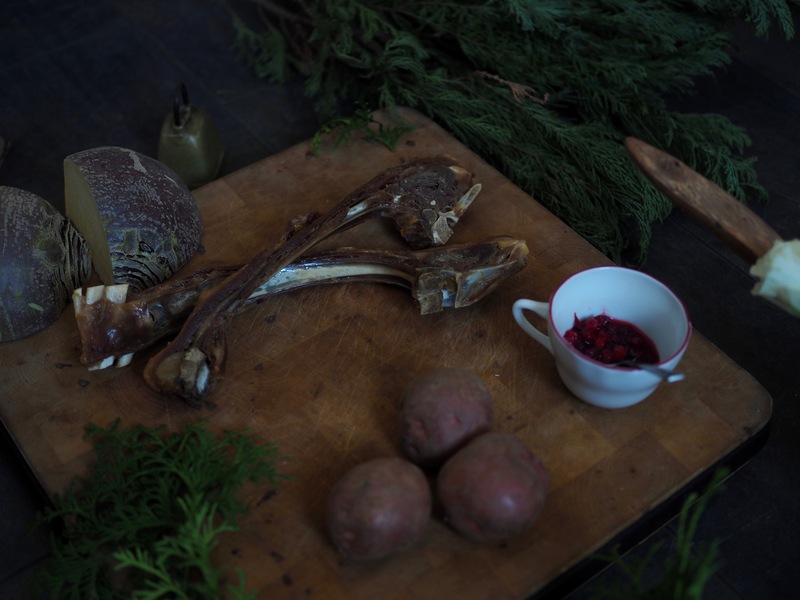 From picking out the lamb, to curing & drying it, to cutting & soaking, to finally cooking and preparing. What I saw then from far (dad), and continue to do so with many people & places, like Rollag Stasjon, is a genuineness. Being mindful of the meal, from start to finish. 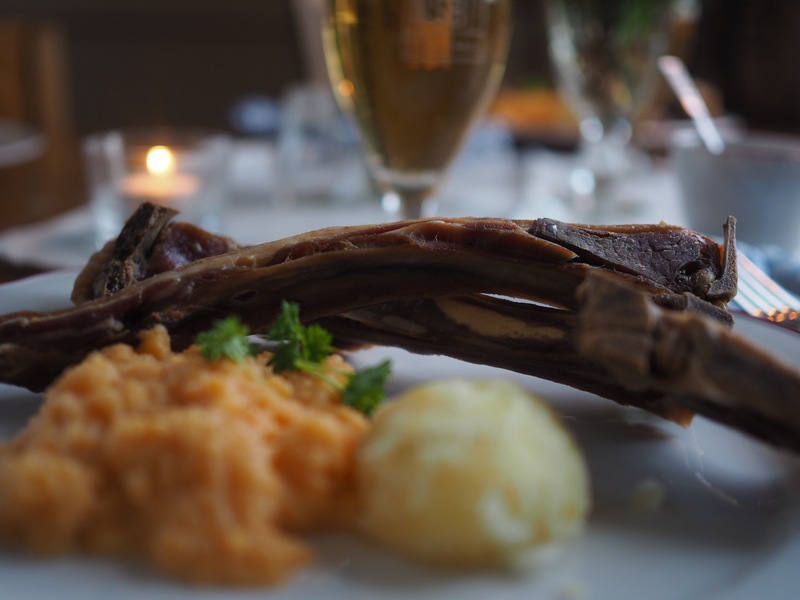 I suggest, whether this is your first time eating pinnekjøtt or your 50th, that you walk through the process yourself. I guarantee, that you will appreciate this special tradition even more so. 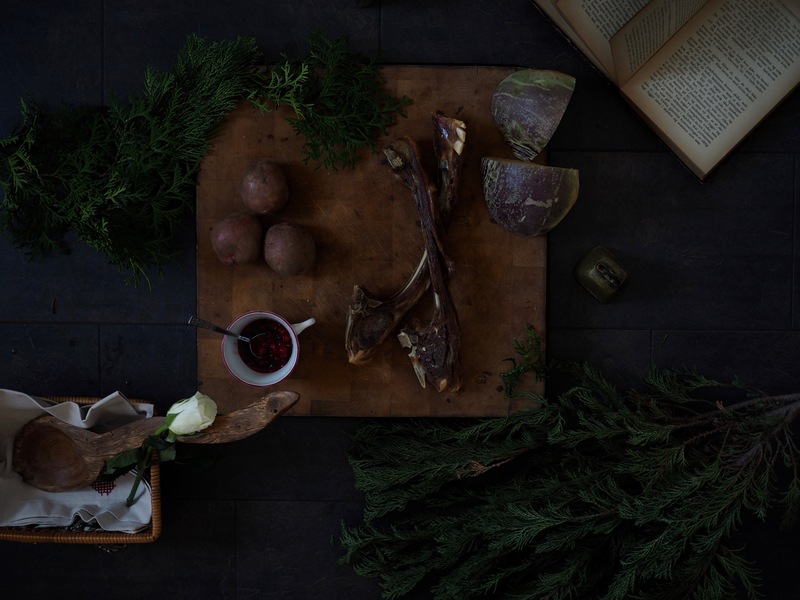 This recipe hails from Ona, Norway where my father-in-law is from. It’s unique in that the meat is boiled first, rather than steamed. By doing this, the meat will be more tender and less salty. Arguably, resulting in the best pinnekjøtt you will ever have! 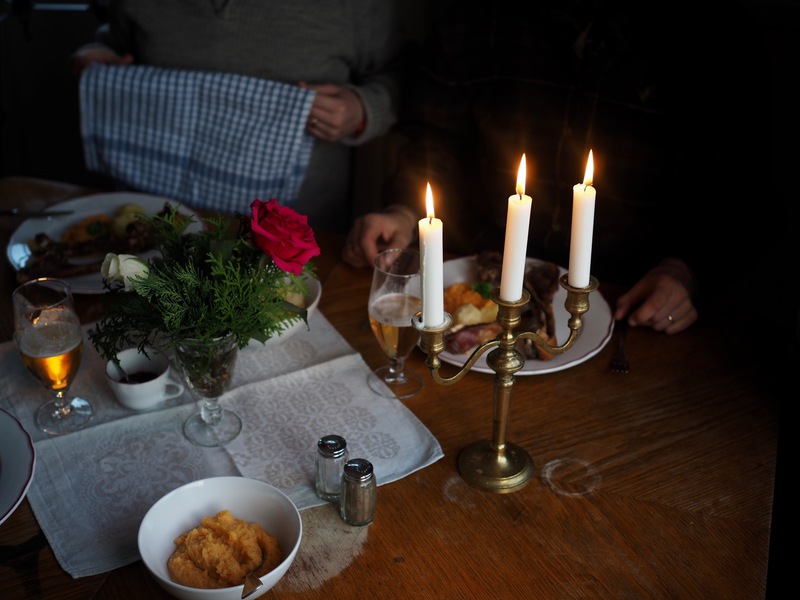 *This process can be skipped if you are purchasing pinnekjøtt which had already been salted & dried. Place the rack in a large container and using your hands, work the salt and sugar into the lamb. Make sure every part of the meat is covered with the salt/sugar mixture. Let it rest in a refrigerator or cool place for 2-3 days (2 for smaller racks, 3 for bigger). The meat will release its juices, so it is important to take this liquid and pour it all over the meat a couple of times per day. Soak the cut, dried ribs in water overnight. Drain and place the ribs very tightly into a large pot. Fill the pot with fresh water until it reaches the top of the ribs (the amount of water should be very minimal as the ribs should take up most of the space in the pot). Cover the pot and bring the water to a small boil over medium heat. Simmer for 2-3 hours or until the meat loosens easily off the bone. Preheat the oven to 225 degrees celsius/ 437 degrees fahrenheit. Take the ribs out of the water, leaving the water to cool slightly. Place the ribs in a long & deep roasting pan. Cover with foil as you wait for the cooking water to cool slightly. Once cooled, you will notice scum & fat have settled on the top of the water. Carefully scoop it out and place in a bowl and reserve. Remove the foil from the meat. Pour the reserved scum and fat, along with some butter, cut into cubes, over the meat. Bake, uncovered, for 15-20 minutes, turning the meat over half way through the cooking time & basting the meat with its juices. Take the ribs out when they have a nice color and the fat is becoming slightly crispy. 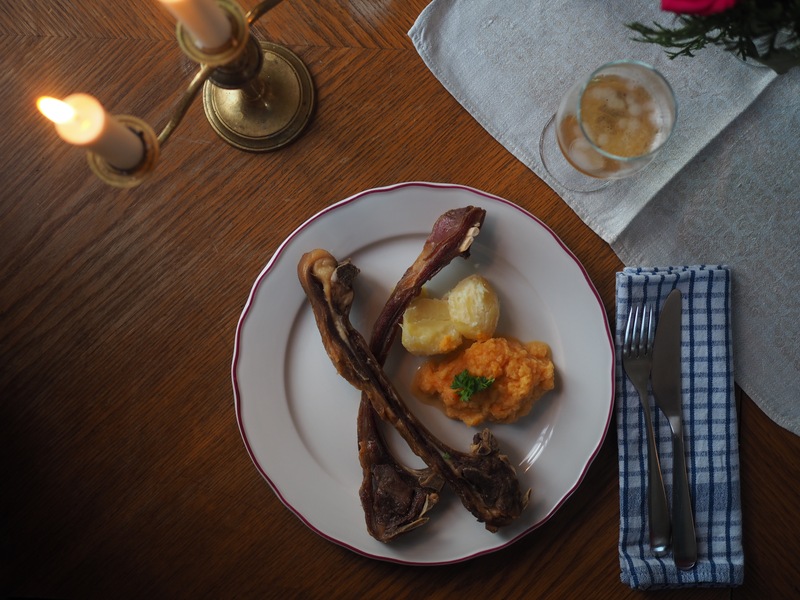 Serve with traditional kålrabistappe (mashed rutabaga & carrot stew), boiled potatoes and a gravy boat filled with the juice from the meat. Finish it all off with a shot of aquavit. Beautiful, hope I will get to experience this! I enjoyed reading your post. I like learning about culture and traditions in other places. The pictures are beautiful!